Collagen Induction Therapy (CIT) Device used to treat skin problems such atrophic scars (acne scars, chicken pox scars), stretch marks, and reduce appearance of wrinkles. The uppermost skin-layer, the epidermis, is a brick-like structure of scales. The mico-needles only push them aside, forming tiny mico-pores. 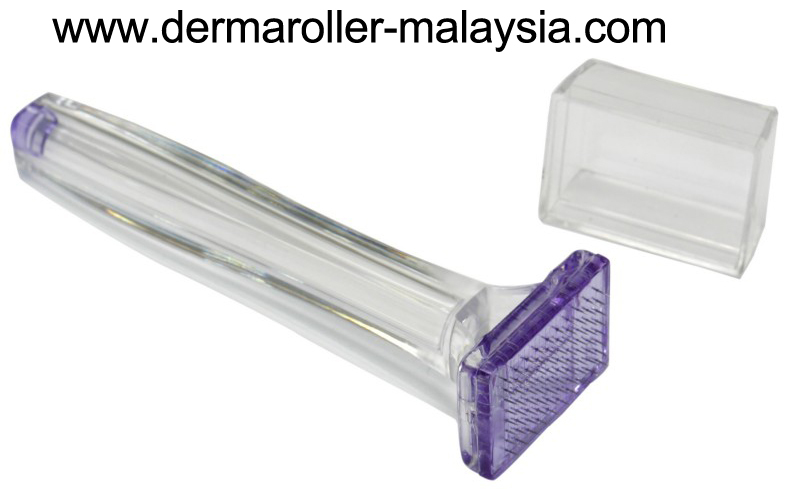 While the dermal roller over the skin the previous applied substance (cosmetic only) is transported the deeper skin layers. Parallel to this action the stratum corneum acts like a longterm depot to retain the active substance. -0.5mm or 1mm or 1.5mm needle length. Stamp size is 2cmX3cm. -Sterilized, sealed in individual pack. -Professional use only, buyer assumes responsibility for use of this device. 1. The treatment is free of pain. 2. No negative side effects. 3. You can use it at home, whenever you wish. 4. Apply your cosmetic on the skin-and roll it in. 2) A plastic cover (Protect the head of needles). 3) A plastic bottle to keep the derma-stamp. 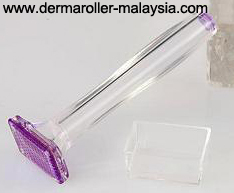 Product : Derma-stamp. All items are new set. Price : RM75 per box.